Wow! A great-looking barrel of colored glass ready for tumble-polishing! This is medium-size landscape glass that we purchased from American Specialty Glass. It's going to make some beautiful tumbled glass! If you want to make some tumbled glass the first thing that you need to do is to find some rough glass. We are always on the look-out for interesting materials that we can tumble and in the article below we share a few of our sources with you. We prefer to purchase glass that is already the desired size for tumbling. We also like glass that is blocky in shape, transparent, gemmy and colorful. Our favorite glass for polishing in a rock tumbler is a product known as "landscape glass". It is sold at some building supply, home improvement and garden supply stores. It is made from recycled glass and used as a ground cover in shrubbery, planters and gardens. However, we like to process it in a tumbler to produce extremely gemmy tumbled glass. Landscape glass is sold in a range of sizes. Chunky pieces between 1/4" and 2" are great for tumbling. They look like gemstones when they are finished. You can purchase landscape glass for under $1 per pound and up depending upon the quantity and colors purchased. Some colors are much more expensive than others. Blue, green and amber glass can be inexpensive but red and orange usually cost a lot more. You might be able to find glass to your liking at American Specialty Glass or Bourget Brothers. Another place that you might find it is at a building supply, home improvement or garden supply store near your home. Spring is the best time to look for it at a local store because that is the busy season for landscaping. This photos shows a one pound package of medium-size landscape glass from American Specialty Glass. 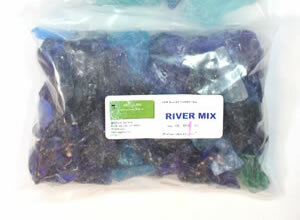 This selection made up of various shades of blue glass is known as "River Mix". Craft stores can be a great place to purchase glass for tumbling. We have seen mesh bags of rough glass at craft store chains such as Michael’s, Joann Fabrics and Hobby Lobby (see photo in right column). 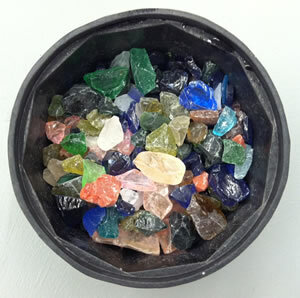 These are chunky pieces of colored glass that range in size between 1/4" and 1 1/2" - the perfect size for your tumbler. This glass isn't extremely expensive. You can obtain it for a few dollars per pound. We recently purchased a couple mesh bags of beautiful, transparent pink glass (that looks like rose quartz) for just $2.79 per bag at Michael's. Here is a package of stained glass scrap that we purchased at Hobby Lobby. 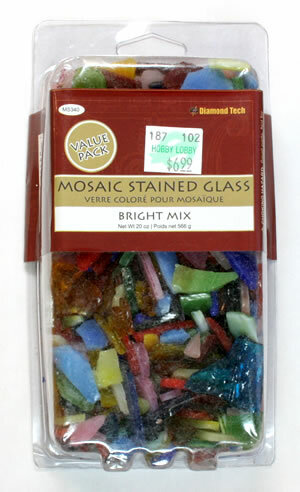 This mixture works great if you need small, flat, thin pieces of very colorful glass. Scrap pieces of stained glass make colorful glass tumbles. If you or someone you know makes items from stained glass, you can save the unusable pieces for tumbling. Perhaps a local stained glass shop will give (or sell) you their scrap. Some craft stores sell scrap stained glass, often under a crafty name such as "mosaic glass". We recently purchase a package of scrap stained glass at a Hobby Lobby store. See package photo in right column. Scrap stained glass is great if you need small, thin pieces of flat glass. 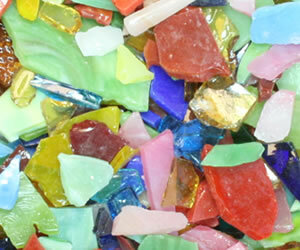 The stained glass mixes that can be purchased from a craft store usually give you a very colorful mixture. Some people think that they want to tumble bottle glass but they are usually disappointed. Most glass bottles have very thin walls. After broken pieces have been tumbled they are so thin, so curved and so fragile that they break easily - and are dangerous to have around. The only glass bottles that are worth tumbling are those that have really thick walls - and these days about the only place you can find that type of thick glass is on antique beverage bottles. That's why we don't tumble bottle glass. Photo of scrap stained glass. The pieces can be very colorful and are usually about 1/8" thick. This material is so thin that you can skip the coarse grit step - just tumble in medium grit until the edges have been smoothed. Whatever source you use to obtain your glass, be careful! Glass is very sharp and will cut you. Wear gloves and protective clothing. Safety glasses and a dust mask should always be worn when handling or sorting pieces of glass! Instead of breaking glass yourself, we recommend purchasing landscape glass or nice thick pieces of colored cullet. You can often find these for under one dollar per pound. Glass is a lot softer than jasper and agate so it doesn't require as much time to shape. Here is a quick set of instructions... If you are new to rock tumbling or want a lot more details then check out our article and video titled: "Making Tumbled Glass with a Rock Tumbler". Frosted Glass is Interesting Too! You don't have to polish all of the glass that you tumble. Some people really like the appearance of "frosted glass". To make frosted glass just run it in the tumbler with coarse or medium grit long enough to obtain the desired shape and then stop.